• PLOT SUMMARY: Thief. Goddess. Headmistress. Queen. The X-Man called STORM has always defied a single title. And her desire to better the world has never been limited to only her own kind. 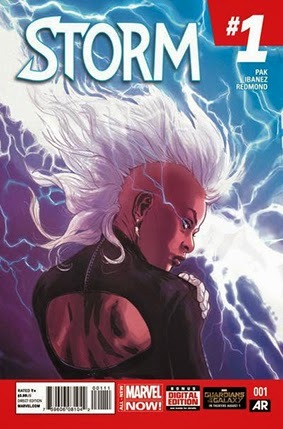 On a mission to foster goodwill and safeguard the mutant race's continued existence in her own way, Storm will travel the globe, confronting man and mutant, god and monster and everything inbetween. She will overthrow tyrants, quell tsunamis and strive to see her dream for the world realized. She is STORM, a hero like no other....and the skies will tremble at the sight of their namesake. (W) Greg Pak. (CA/A) Victor Ibanez.